I grew up in a meat and potatoes house hold with a deep fryer living on the counter. Still I have always had a hard time eating meat which was a fight and challenge for my parents who hunted and created the family meals around the meat then adding a few sides. I ate only what meat I was forced to at dinner or just enough to keep me from being sick. In high school I became a “vegetarian” just taking meat out of your diet is not sound and I became anemic and struggled so would eat meat every now and then as I was uneducated in how to successfully live without meat. Later I would dabble with a vegan diet and on my backpacking trip in Australia had a lot of time to read about vegan and vegetarian lifestyles. Being my best test subject I have learned so much. Taking a Holistic Nutrition course I learned even more and now eat vegan with some wiggle room when out so it isn’t as confining, for me strict vegan made me a little crazy and food obsessed. You will find what works for you, even if you love meat and dairy you might also enjoy some of these options from time to time!Feel free in your kitchen, I like to make foods that allow me to be creative, to sub certain ingredients for others if that’s what I have on hand today. What I am not good at is following exact recipes, sure I can, but for me it takes all the fun out of being in the kitchen. You will see this in the recipes I share, there will be a lot of room for error AKA self-expression. Have fun be creative and open to change. Can we use that as the standard on the food for thought and have the blogs change or no? 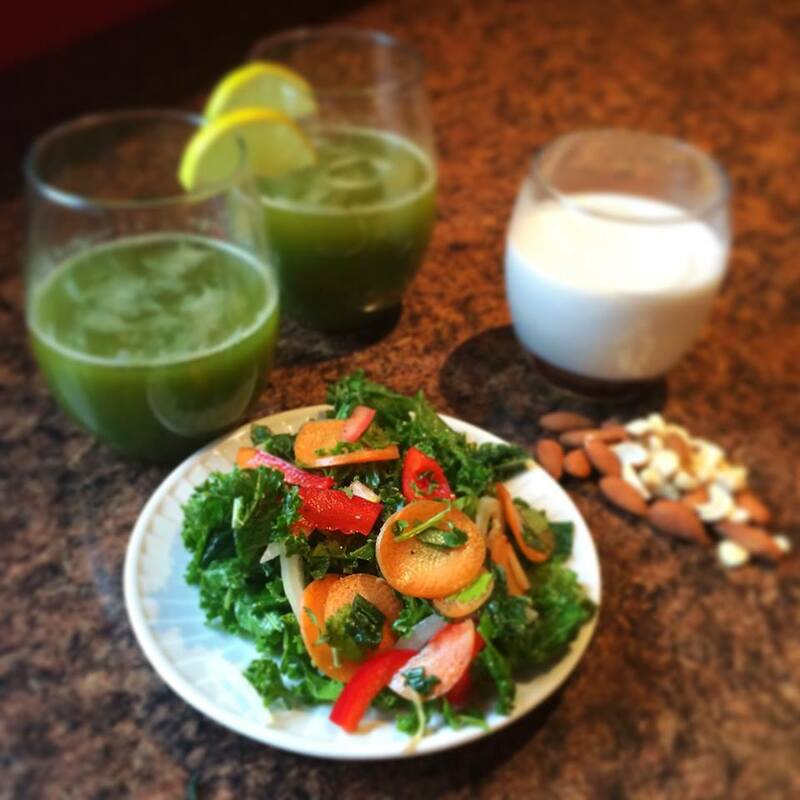 Staples in my house are version of these: green juice, raw kale salad, homemade raw nut milk. They vary in ingredients but some form of juice, raw vegan salad and homemade nut “milk”. Nut “Milk” Animal’s milk is really something we should be leaving behind after we outgrow drinking milk from our mom. Yet unlike every other animal that is weaned off milk once they no longer need the support for growth that the parent’s milk is so perfect for (for their own species), we continue to consume milk. It is so odd to me the disgust most people have at the idea of drinking human breast milk as an adult yet are happily drinking breast milk from cows. Asides from the fact that many humans do not have the ability to break down milk, that we really have no need for it, our current process for mass producing milk creates a situation where milk is full of antibiotics and contains puss… gross. On top of all of this, the life of these factory farmed cows is abusive, the living conditions are horrifying, and we are perpetuating it by buying the product. I have a solution. Homemade nut milks! It is really easy and tastes great. I would recommend being mindful of the quantity you are consuming as they are packed with energy! Homemade almond milk (can sub most nuts and even seeds) One cup raw organic almonds- soak for 8 plus hours 3 cups water Blend together (I use the Vitamix to blend really well) blend very well Strain through cheese cloth Enjoy! Green Juice Juicing is a great way to increase your vitamin and mineral intake. General rule of thumb 2/3 veg to 1/3 fruit. Always more veg to fruit, try using lots of greens, cucumbers, spring greens, dandelion leaves, kale, lettuce, chard, just to name a few but get creative. Add some ginger, or garlic these a strong so start small you can always add more. I like to add half a grapefruit and some carrots sometimes even a green apple. Honestly paly around sticking to more veg then fruit and even be mindful of our sweeter veg maybe no fruit but beets and a red or yellow pepper might be just what you need. At first you might not be in love with the taste but stick with it for a while your body will love it and your taste will come around. Put all into a juicer and voila! This one was: 1 bunch of kale 1 cucumber Handful of spinach 2 celery stocks Half a green apple Half a grapefruit Half a lemon A small chunk of ginger I always like mine over ice. Kale Salad Let me tell you the secret to kale salads… you have to massage the kale. 4 cups of kale leaves… take off the stems they are really bitter. And cut up small A shake of sea salts Half a lemon freshly squeezed 1 ripe avocado Put all these in a bowl and then get your hands in there and massage it all together breaking down the kale the best you can. Unlike lettuce the kale won’t go soggy so scrunch it right up! Add in any or all of the following after to finish it off: Sun dried tomatoes Slivered red onions, carrots, or red peppers Sprouts or peas Sunflower or pumpkin seeds Feel free to play with this and add or take out till you love it!